Ships are large, complex vehicles which must be self-sustaining in their environment for long periods with a high degree of reliability. A ship is the product of two main areas of skill, those of the naval architect and the marine engineer. The naval architect is concerned with the hull, its construction, form, habitability and ability to endure its environment. The marine engineer is responsible for the various systems which propel and operate the ship. More specifically, this means the machinery required for propulsion, steering, anchoring and ship securing, cargo handling, air conditioning, power generation and its distribution. Some overlap in responsibilities occurs between naval architects and marine engineers in areas such as propeller design, the reduction of noise and vibration in the ship's structure, and engineering services provided to considerable areas of the ship. A ship might reasonably be divided into three distinct areas: the cargo-carrying holds or tanks, the accommodation and the machinery space. Depending upon the type each ship will assume varying proportions and functions. An oil tanker, for instance, will have the cargo-carrying region divided into tanks by two longitudinal bulkheads and several transverse bulkheads. There will be considerable quantities of cargo piping both above and below decks. 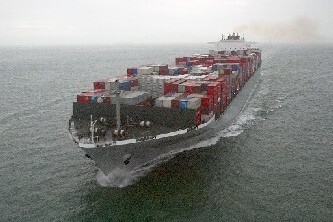 The general cargo ship will have various cargo holds which are usually the full width of the vessel and formed by transverse bulkheads along the ship's length. Cargo handling equipment will be arranged on deck and there will be large hatch openings closed with steel hatch covers. The accommodation areas in each of these ship types will be sufficient to meet the requirements for the ship's crew, provide a navigating bridge area and a communications centre. The machinery space size will be decided by the particular machinery installed and the auxiliary equipment necessary. A passenger ship, however, would have a large accommodation area, since this might be considered the 'cargo space'. Machinery space requirements will probably be larger because of air conditioning equipment, stabilisers and other passenger related equipment. Three principal types of machinery installation are to be found at sea today. Their individual merits change with technological advances and improvements and economic factors such as the change in oil prices. It is intended therefore only to describe the layouts from an engineering point of view. The three layouts involve the use of direct-coupled slow-speed diesel engines, medium-speed diesels with a gearbox, and the steam turbine with a gearbox drive to the propeller. Machinery, other than the main propulsion unit, is usually called 'auxiliary' even though without some auxiliaries the main machinery would not operate for long. The items considered are air compressors, heat exchangers, distillation equipment, oil/water separators, sewage treatment plants and incinerators.